Answering the pleas of thousands of collectors, the fifth wave of figures in Hasbro's 2012 Vintage Collection gave us, for the first time ever, Grand Moff Tarkin from A New Hope on a Kenner card. In addition to this the wave also offered four other brand new figures including Odd Ball (Clone Pilot) from Revenge Of The Sith, Nikto (Skiff Guard) from Return Of The Jedi, Starkiller (Vader's Apprentice) from The Force Unleashed, and Shae Vizla (Old Republic Bounty Hunter) fromThe Old Republic. This collection began hitting shelves in June 2012, and the initial releases feature an easy to remove sticker advertising the "Life-Sized Darth Maul Statue" giveaway. All these figures also feature a packed in pamphlet with additional details on the giveaway. 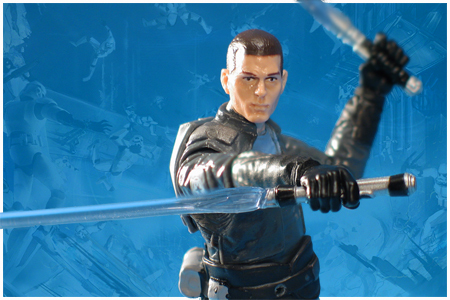 Starkiller is an all new figure.